If you’re looking to become a professional Twitch streamer, then affiliate status is extremely important. The first major step on the path to the dream of professional gaming (or chatting), becoming a Twitch Affiliate is an early sign that you’re doing something right. For many, becoming an Affiliate takes several months. However, with some sweat and strategy, you can get there in just under a month. What is a Twitch Affiliate? Before we can discuss how to become a Twitch Affiliate, we should reiterate what a Twitch Affiliate is. Becoming a Twitch Affiliate means opening the door to making money on Twitch. Once you’ve achieved affiliate status, you can begin getting paid subscriptions. Of course, this is the primary (and, therefore, most important) method of earning money on Twitch. Being an affiliate also unlocks donations in the form of bits, which is a great tool for many. As an affiliate, you can also earn money from game and game accessory sales. This is often less profitable than the other methods, but can be important for some streamers. Affiliates will soon be able to make money from ads, as well, which is something to take note of. While it often takes Partner levels of viewership for ads to be an effective revenue stream, this could be a great way to make some money on your way there. There are a few non-revenue based changes that come with affiliate, as well. For example, affiliates gain priority access with video transcoding — making the process much quicker. You also gain the ability to rerun previous broadcasts, and to premiere new videos live on Twitch. There are some further details with payment, also. Affiliates have chargeback protection and are paid out in 60 days, but the streamer must cover chargebacks. How is being an affiliate different from being a Partner? Speaking of partnership, it’s important to know the difference between being a Twitch partner and a Twitch affiliate. If you’re an astute viewer, you might have noticed that there is a difference. You might have seen special streams on the way to Partner, too. However, even most people that know there is a difference aren’t exactly sure what that difference is. Put simply, the difference boils down to this: a Partner has been vetted by Twitch as someone that they want to represent the company. An Affiliate, in comparison is earning Twitch money, but is not yet considered an asset to the company. As a result of this representative status, Partners are given the full suite of tools necessary to support themselves. An Affiliate can certainly get by, but a Partner can do much more. Being a Partner means becoming verified, and being verified means unlocking your full earning potential. 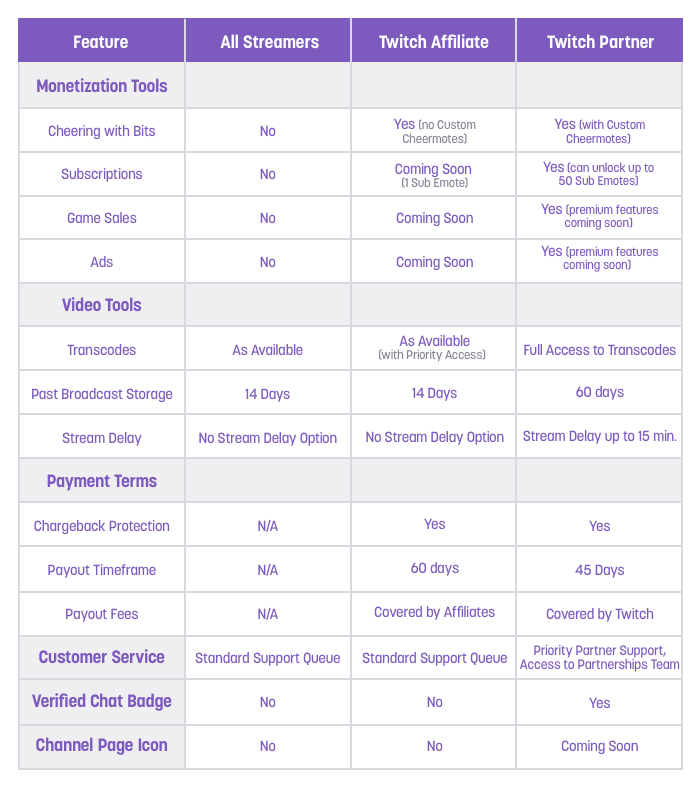 The infographic below sums up the differences between regular streamer, affiliate and partner. Why is twitch affiliate status Important? While becoming a Partner feels much more important for a majority of streamers, becoming an Affiliate should not be understated. Becoming a Partner means being able to do so many things - it’s the end goal for a majority of streamers - but it would be impossible if it weren’t for Affiliate status. If Twitch streaming is really what you want to do with your life, Affiliate status is really what will let you do that. Becoming an Affiliate means that you can start earning money. It might not be at the same levels as becoming a Partner, but it’s nothing to scoff at, either. Once you’ve achieved Affiliate status, you can begin to phase out the day job. You can easily use Affiliate status to begin earning a paycheck on Twitch each week. Or, if you’re looking to grow sensationally, you can use the money you earn from Affiliate status to improve your stream. The more money you have flowing into your business as a streamer, the more you’ll see flowing out of it. Of course, becoming an Affiliate doesn’t mean you’re guaranteed to see insane amounts of cash in your account when you wake up the next morning. Instead, the work will have to continue. There are more than a few ways to earn money as an Affiliate. If you're looking for more dependable ways to make money, check out our post on how to get your first twitch stream sponsor. If you want to make money as a Twitch Affiliate, you need to engage with your audience, and look for continual growth opportunities. This should be common sense: streamers earn money by having fans, so the more that you can do to gain fans, the more money you’ll make. One of the most important tenets of this is rewarding the behavior that makes you money. As an Affiliate, this would be donating and subscribing. Many streamers reward both behaviors, but separately. For example, some streamers have a day dedicated to gaming with their subs. RTGaming set up a Minecraft server where his subscribers go to hang out, mess around, and hopefully be featured on his stream. People love this sort of thing, and it will easily convert a follow into a subscriber. Other streamers have a Discord server for their subs, which is certainly something to think about. Note, though, that if you want to do this you need to be prepared to talk, and it’s best to have a few people ready so the Discord doesn’t look dead when people arrive. Donation rewards, unlike sub rewards, should be one time pay offs. This is derived from the nature of the two payments, of course. A donation is not usually recurring, so you need to find ways to give a reward once and hope that other will follow. You might, for example, play a game of the donators choice if they donate a certain amount. Or, you might play someone one on one. You can offer rewards at different tiers, too: you might give someone a shoutout for a $5 donation, and mic up with someone for a $50 donation. Twitch looks at your application in a 30 day block, so becoming an Affiliate in 30 days isn’t impossible. However, it can be difficult. While the requirements for Affiliate might seem rather innocuous, they can actually be quite tough if you aren’t coming in with an audience. But, there’s no reason not to go for it. Even if you don’t hit Affiliate, you’ll be much closer than if you didn’t try. This strategy might not work 100% of the time, but it can get there easily if you’re vigilant. Of course, you’re not looking to get in on these exact numbers. If you want to be confident in your Affiliate application, you’re going to look to outdo these numbers. Some you’ll want to shoot much higher. For example, 3 concurrent viewers is difficult to achieve if you’re looking for exactly 3. Because this is a viewership average, you should actually shoot for something like 20 concurrent viewers. You’ll also want more than 50 followers, so let’s set the target at 100 followers. 7 unique broadcast days is just about right. If you’re a student or working a full time job, you can probably only afford to broadcast for 7 to 9 days a month. If you can use Friday evening, and Sunday afternoon, you’ll only need one more day to make it. You’ll also need to stream for 500 minutes (or 8 hours if you don’t like math) across these days. But, hour long streams aren’t going to do much to help you out. You should aim for streams of around 4 hours on average, spread across your 7 to 9 days. We wouldn’t go below 2 hour streams in any scenario, as streams often do pick up steam over time and you don't want to lose your viewership momentum. Remember to also budget time for all of the non-streaming parts of streaming, as well. This can seem like a lot of work, but it will be a large payoff when you become a Twitch Affiliate. Once you know what you’re looking for, the next step is to figure out how to do it, and when you can do it. All of the following are ideas for getting to Affiliate status, which you can apply to your case. Make sure you have a schedule, as well. Consistency is incredibly important for a streamer. If you don’t like using social media, you’re going to have to get over it. If you do like using social media, you likely already have a base built up of people that will appreciate your stream. Your friends who game are likely to tune in. In fact, you might want to ask some to join personally. Friends are great social proof to have in chat, and often a close circle can account for the full 3 viewers you need to be averaging. Even if you’re bringing friends along, you’ll need to make some on Twitch, as well. If you look at the game you’re going to be playing on Twitch, you’ll see a lot of streamers with no or single digit viewers. Tune in. Chat with them. If you can make an honest friendship with other streamers, they’ll be happy to help promote you. They’ll become your early fans and viewers. As we’ve written about before, networking is great when you don’t think of it as networking. When you simply set out to make friends, great things can happen. Try this before you go live: find another streamer with 7 to 10 viewers. For an hour before you go live, while you’re setting up, just talk to them. Have a conversation like you’ve been best friends for your entire life. When you’re ready to leave, let them know that you’re heading off to your own stream. If you’ve been cool enough, the streamer and their viewers will almost always check you out when they have the chance, and some will happily host you when it’s time for them to sign off. By far the toughest part of becoming an Affiliate is gaining 50 followers. The other obstacles are easy to jump, but getting 50 people to ask for more of you is difficult. Unfortunately, there is no trick that you can use here. If you want to gain followers, you’ll have to engage them both directly and indirectly. To engage them directly, try setting up a server where you play a game with only the people who follow you. If this isn’t possible in the game you’re playing, try to offer some alternative. Allow people to challenge you, ask you a question, or do something that will otherwise reward them. Let new followers give you a truth or dare, or a trivia game. Make it fun. But, mostly, you just have to be entertaining. If you can get people to your stream, the only way to make them return is to try your best to be fun. You will get better at this over time, though you might be surprised about how well you can do if you just let your personality shine. Naturally, the first step after Affiliate is to go after Partner. However, this is a long term goal for a majority of people. The application can’t even begin for several months. So, it shouldn’t be at the forefront of your mind. Do keep it somewhere in there, though. Partnership is a great goal to hunt after. In the meantime, be sure to set up your Affiliate profile with payment and tax information so you can receive your payments from Twitch. Where you might want to draw your focus instead is to making a living as a Twitch streamer. Many assume, incorrectly, that you can’t earn a decent amount of money until you’ve made Partner. This would disincentivize many would-be streamers, because Partner seems so unattainable. However, this is exactly why Affiliate exists. If you use some of the principles that you’ve found here, you should be able to continue to grow your stream and gain followers as you move onwards. Now that you’ve achieved Affiliate status, though, some of those followers will become subscribers. Some of the fans that you play with will begin to donate. And you will be on your way to living the dream.